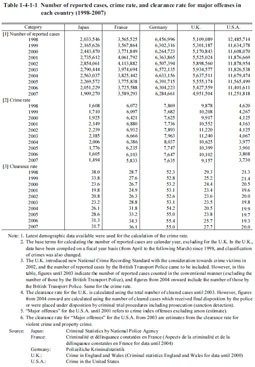 Table 1-4-1-1 shows the number of reported cases, crime rate, and clearance rate for major offenses in the countries concerned over the 10 years from 1998 to 2007 (See Appendices 1-7 and 1-9). In 2007 the number of reported cases decreased and the crime rate declined from the previous year in each country. The clearance rate rose from the previous year in Japan, France, U.K. and U.S.A. Although not a completely accurate comparison, as far as a statistical data comparison is concerned, the crime rate for major offenses was lower in Japan than in the abovementioned four countries in the years concerned.